BIZZARO: Was a pet project of Maxwell Lord, Genetically modified to look like and have the same powers as Supergirl, she picks up a vehicle from a bridge and tosses it, while the real Supergirl and her foster sister Alex Danvers watch on their TV set. Bizarro attacks Kara on her date with Adam Foster. Her skin cracks and turns gray-white when hit by kryptonite fired by Alex Danvers. She later kidnaps James Olson, but is finally stopped by Supergirl and Alex with blue kryptonite bullets. Supergirl takes the incapacitated Bizarro back to the DEO where she is returned to a coma state until they can find a way to help her. 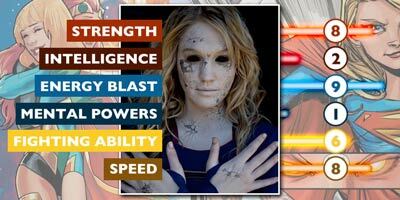 This version isn't a clone, but instead was created by genetically altering a permanently comatose human female that closely resembles Supergirl and infusing her with Supergirl's DNA. A total of seven girls were used by Lord for the experiment, the rest presumably discarded as failures.